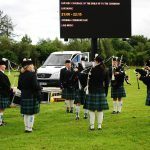 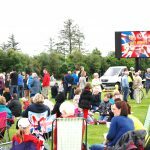 SCF out of its desire to engage with the community organised and funded (with the help of a grant from Angus Council) our own opening ceremony in Martin Park, Kirriemuir where we hired a lorry mounted big screen so that everyone could watch the televised opening ceremony in London. 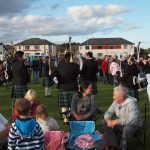 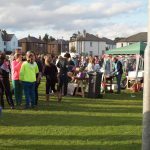 We had our own Olympic Flame lighting ceremony, Forfar Pipe Band, DD8 and their bands, childrens activities and and free burgers. 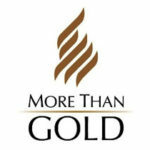 More Than Gold, of which the Evangelical Alliance is a founding member, was an umbrella organisation representing the main denominations in the UK and brought them together to help churches seize the opportunity that the Olympics provided. 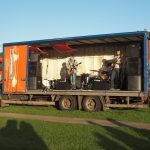 Its mission was to enable the Church to engage with the 2012 Games and help “thousands of churches to taste the excitement of reaching their community in fresh and ongoing ways in Jesus’ name”. 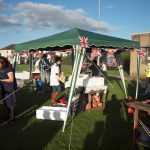 It was far more than a sporting event. 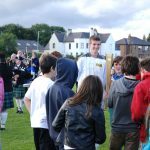 Like many Christians living in Olympic host nations have discovered since the first contest in 1896, the Games presented a unique and extraordinary opportunity to share something of the gospel. 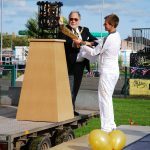 That’s why hundreds of churches across the UK came together under the More Than Gold banner drawing up a co-ordinated, strategic approach for the Games and to make sure they did not let the moment pass them by.